Home / Unlabelled / IS BASIL QUALIFIED TO SPEAK FOR PANGU PATI IN DECLARING LOYALTY TO O'NEILL? IS BASIL QUALIFIED TO SPEAK FOR PANGU PATI IN DECLARING LOYALTY TO O'NEILL? It is very interesting to see Sam Basil and his deputy William Samb come out publicly to declare their loyalty and the loyalty of Pangu Pati to Peter O'Neill and his government. The question Pangu Pati supporters need to ask is this? Is Sam Basil speaking for Pangu Pati and its MPs or is he speaking for himself? 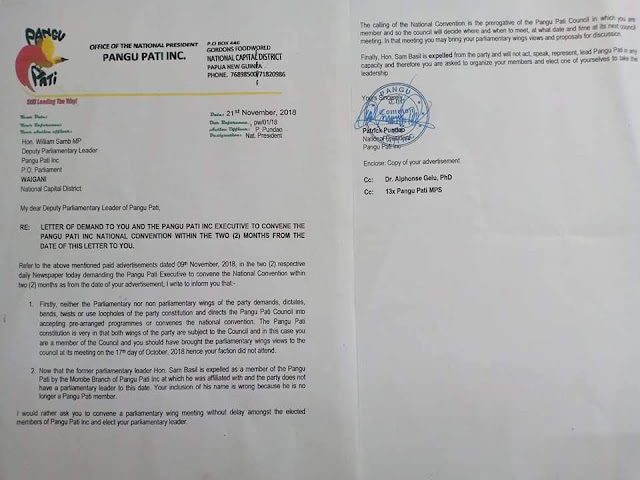 A letter uploaded on Facebook not long ago shows that Sam Basil was removed as a member of Pangu Pati by the Morobe Branch of the party. Party President Patrick Pundao then wrote to deputy Parliamentary leader William Samb demanding him to convene a meeting to elect a new Parliamentary leader of the party. 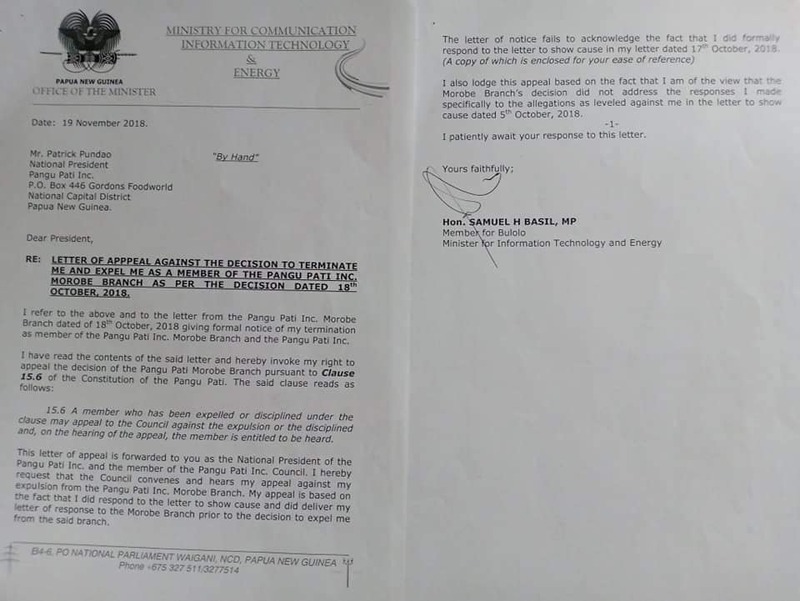 Another letter uploaded at the same time was the appeal by Sam Basil against the decision to terminate him and expel him as a member of Morobe Branch of Pangu Pati. So Sam Basil has confirmed and acknowledged his sacking and expulsion from Pangu Pati. Why then is he still speaking on behalf of the party if he is no longer a member of the party, let alone being leader of the party?? This is a mere media propaganda designed to fool the public. The fact is that Sam Basil does not represent nor speak for Pangu Pati because he has been expelled and is no longer a member of the party. In 2017 when Sam Basil made the decision for Pangu Pati to move to government, he had a hard time convincing many of his newly elected party members, especially the Morobe MPs who had campaigned and won their seats on the back of strong anti PNC and anti O'Neill campaign themes and slogans. Many of the Morobe Pangu MPs felt so uncomfortable going back on their words and their campaign promises to their people. They felt they were betraying their people's trust and confidence in them by moving into government with the very Prime Minister and Party they had campaigned against and defeated. They reluctantly moved after their party leader Sam Basil made the commitment to stand with them and explain the reasons for their moving to their people. Being a part of this worst ever PNC government still makes many of them uncomfortable. The move was for the benefit of one man and one man alone, Sam Basil himself. From being given a Ministerial portfolio to business opportunities for his Armsec Security and whatever other benefits, everything went to Sam Basil. Other Pangu MPs were mere numbers and spectators to make Sam Basil live his dreams and his fantasies of being in government. It is questionable if Sam Basil truly has the blessing or support of his fellow Pangu MPs to come out and speak on their behalf and to pledge loyalty to O'Neill and his PNC government. Only time will tell if all Pangu MPs truly support Sam Basil in his public pledge of loyalty to O'Neill. 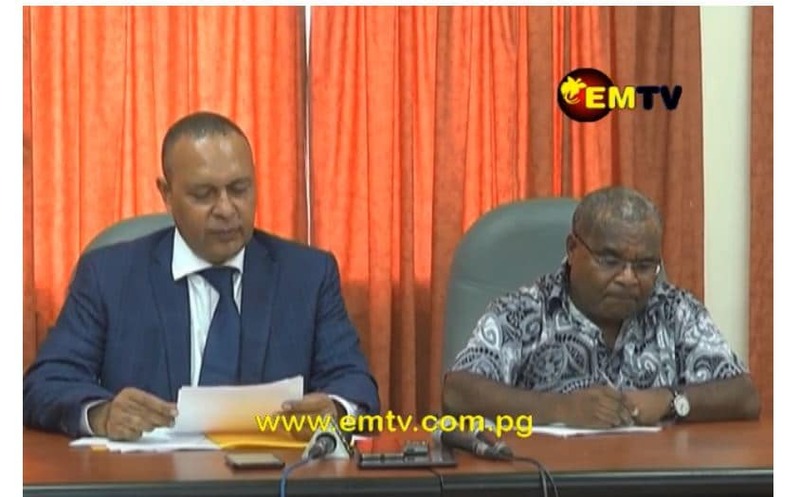 The fact remains that all Morobe Pangu MPs stand to lose their seats in 2022 the longer they remain part of this PNC government led by Peter O'Neill. Don't be surprised if Basil is ditched and left alone with O'Neill by the rest of the Pangu MPs who have gained nothing from being a part of this government but who have been mere numbers for the benefit of one man.